Good morning y'all! Welcome to another edition of Fashion Friday hosted by the lovely Kori over at Blonde Episodes. While most of you are probably posting about fashion designers and what not, I'm posting about A Day at the Races. A day at the Keeneland races. 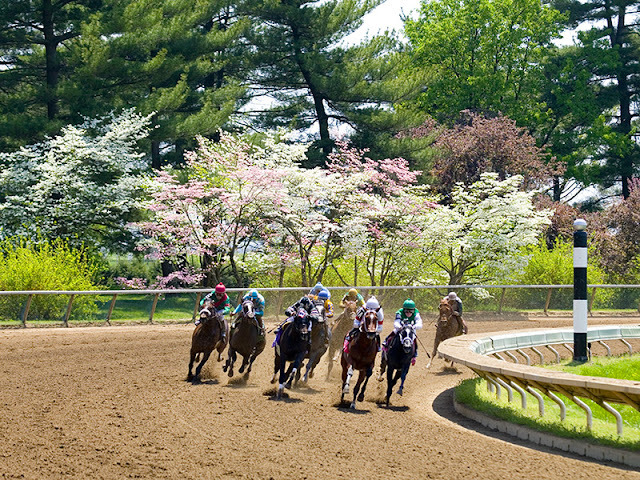 You see, Keeneland, back home in Lexington, Kentucky opens today for the spring season and what I wouldn't give to be there! To drive up this infamous driveway. 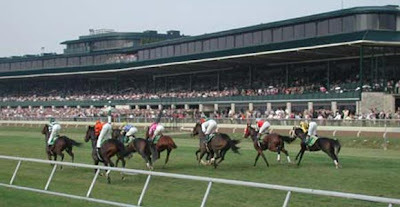 Keeneland brings back a lot of memories from the good 'ole college days when us Phi Mu sorority girls would head out to the races for a fabulous day of socializing, laughter, light betting, mint juleps and exhilirating horse races. One has not experienced swift exhiliration until one has witnessed a horse race. Unlike football, NASCAR, basketball or golf, horse racing is fast-paced and over within minutes. Picture it: everyone crowds around the track for the races, your heart speeds up for a quick minute and a half of a race. You casually and politely yell for your horse to win, holding onto your hat and mint julep carefully, while leaning over the rail ever so slightly to get the best view of the track. The excitement is so quick, you don't even realize the feeling until it's over. If your horse wins, you politely accept congratulations. If they lose, there is not any swearing or upset. One casually (and usually somewhat sarcastically) puts on a frown and says "maybe next time." Now that is a horse race! Another difference of this sport? While one may adorn a favorite jersey or colors to support your favorite football team (as we are known to "bleed blue" in Kentucky), in horse racing, you put your best effort forward when it comes to fashion. People generally take pride in their appearance when going to Keeneland. Hats, dressier sundresses, pearls and small hand bags are the general consensus for the races while men sport button downs and khakis on the more casual side, and maybe even a colorful tie. What exactly would I wear to Keeneland? Well, Lilly Pulitzer of course! Accompanied by my pearls, Kate Spade shoes, handbag and betting receipt, I would be all set for my day at the races. when i was young my family would go to the horse races at colonial downs in va frequently on the weekends! it was so much fun! I love that outfit! I love horse races--they're so fun, and I love getting dressed up for them! Love the outfit! 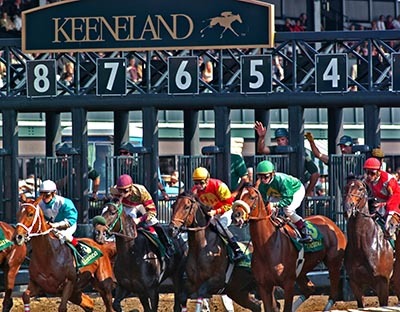 I cant wait to go to Keeneland tomorrow!! I'll have to post pictures! When I woke up this morning thr first thought that when through my mind was that it was opening day and I wasn't there! Being born and raised in Lex and graduating from UK that is still one of the things I hate to miss since I have lived in Nashville. Been here going on 6 years and I still miss it more than ever!!! This outfit is the epitomy of a day at the races! Love it, would like to invite you to link up to my Fashion Friday. This would be a great addition. I have been to the races in Hot Springs and they are so fun! !